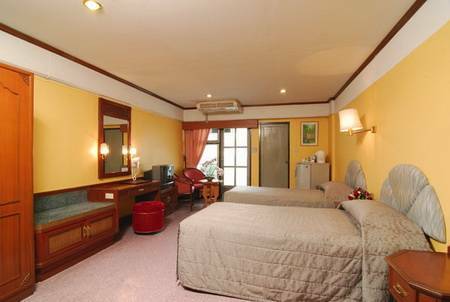 Good location and good food ... Good location, only 5 minutes walk to Khaosan Road. Easy to travel by boat since the hotel is near the main river. Buffet breakfast is great. I LOVE TOMYAM KUNG excellent. Welcome to New World Lodge Hotel, the hotel for both business and leisure travelers. Our friendly atmosphere is evident the moment you arrive. 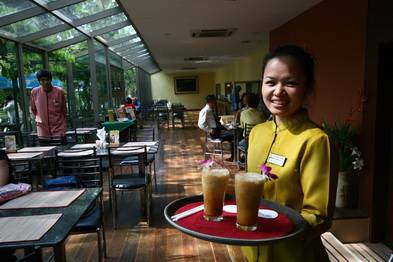 The friendly and courteous staff is always ready to greet you with a smile and Sawadee, Thai custom for a warm welcome. 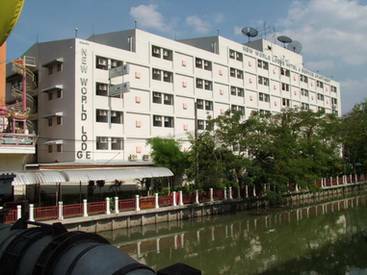 Situated in a quiet location, the New World Lodge Hotel located in the heart of Bangkok. The hotel provide its guests with 172 modern, bright, well appointed en-suite bedrooms : 3 Suites, 54 Deluxe, and 115 Superior. All rooms have windows and balconies, private bathrooms with hot & cold showers, telephone with IDD, color TV with satellite, mini bar and refrigerator. Our Suite and Deluxe rooms also offer in-room safety deposit box and hairdryer. Sara Halal Restaurant and our Room Service offer Thai, European, and variety of Asian cuisine. Fitness Centre and hi-speed internet will make your stay even more pleasant. Our conference and meeting rooms will help your business become a successful one. 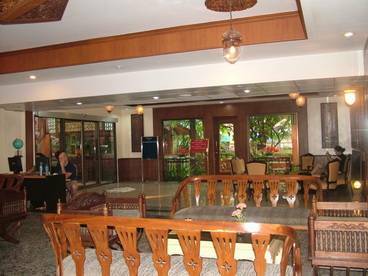 The Hotel is situated in a quiet location, in the heart of Bangkok. 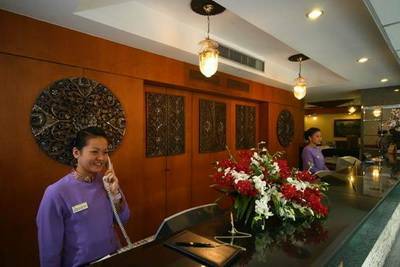 The hotel provide its guests 172 modern, bright, well appointed en-suite bedrooms with 3 Suites, 54 Deluxe, & 115 Superior. Our Suite and Deluxe rooms also offer in-room safety deposit box and hairdryer. House cleaner service is on a daily basis and even same-day laundry and dry-cleaning services are available. 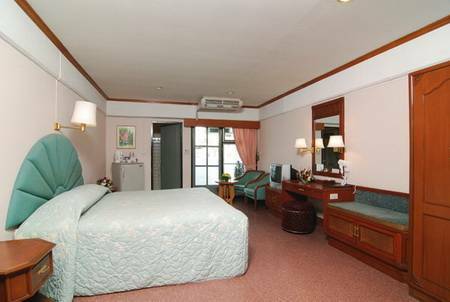 Superior Room : Rates are for 2 persons with Buffet Breakfast. Room with double or twin bed. Balcone, TV, Air Con., Shower with hot & cold water. In-Room Safe Deposit Box, Mini Bar, Fridge. Child under 12 can stay for free with parents using existing bed. Extra bed 500. Sara Halal Restaurant and our room service offers Thai, European, and variety of Asian cuisine. 1 Night Penalty Always - Any cancellations or changes for this property forfeit the full amount of the first changed or cancelled night. Before 16:00 (1st night) - Cancellations or changes must be made before 16:00 (hotel local time) of the date of your arrival to avoid paying the full amount of the first changed or cancelled night. Before 18:00 (1st night) - Cancellations or changes must be made before 18:00 (hotel local time) of the date of your arrival to avoid paying the full amount of the first changed or cancelled night. Minimum 24 Hours (1st night) - A minimum of 24 hours' notice is required by this property for cancellations or changes. Cancellations or changes made within 24 hours of the check in time forfeit the full amount of the first changed or cancelled night. Minimum 24 Hours (all) - A minimum of 24 hours' notice is required by this property for cancellations or changes. Cancellations or changes made within 24 hours of the check in time forfeit the full amount of the booking. Minimum 48 Hours (1st night) - A minimum of 48 hours' notice is required by this property for cancellations or changes. Cancellations or changes made within 48 hours of the check in time forfeit the full amount of the first changed or cancelled night. Minimum 48 Hours (all) - A minimum of 48 hours' notice is required by this property for cancellations or changes. Cancellations or changes made within 48 hours of the check in time forfeit the full amount of the booking. Minimum 72 Hours (1st night) - A minimum of 72 hours' notice is required by this property for cancellations or changes. Cancellations or changes made within 72 hours of the check in time forfeit the full amount of the first changed or cancelled night. Minimum 72 Hours (all) - A minimum of 72 hours' notice is required by this property for cancellations or changes. Cancellations or changes made within 72 hours of the check in time forfeit the full amount of the booking. Minimum 7 Days (1st night) - A minimum of 7 days' notice is required by this property for cancellations or changes. Cancellations or changes made within 7 days of the check in date, forfeit the full amount of the first changed or cancelled night. Minimum 7 Days (all) - A minimum of 7 days' notice is required by this property for cancellations or changes. Cancellations or changes made within 7 days of the check in date, forfeit the full amount of the booking. No Cancellations - This property does not accept cancellations. No Cancellations or Changes - This property does not accept cancellations or changes to bookings. Refunds are not available. Its location provides on easy access to tourist attractions. Only a brief stroll takes you to Banglumphu shopping area or to the famous KHAOSAN ROAD, the place where entertainment for the persons who young at heart shall enjoy themselves day & night until dawn. The Chaopraya River, the River of King, is just over 100 meters away from the hotel where you can go for joking, morning or evening walk at Suan Santi Chaiprakarn Park or along the bank of the river at any time of the day. Being only 40 kilometers from Suvanabhumi International Airport, you can take expressway to reach the hotel within less than one hour. Central Railway Station, the Southern or the Northern and Northeastern Bus Terminals all are very convenience to reach from the hotel.